Rumors have surfaced online about the early release date of the upcoming Samsung Galaxy Note 9. Reports coming in from Korea indicate that the company will start its OLED panel production as early as April, which is a good couple of months ahead of its usual production that happens in the month of June. This clearly suggests that we can expect a launch anywhere in July or August this year. The display of Galaxy Note 9 is expected to be 6.38 inches, which is 0.06 inches larger than its predecessor Note 8. Regarding the fingerprint sensor, looks like the technology that’s required to embed the scanner behind the display isn’t ready yet. Hence it will likely be at the back of the device. 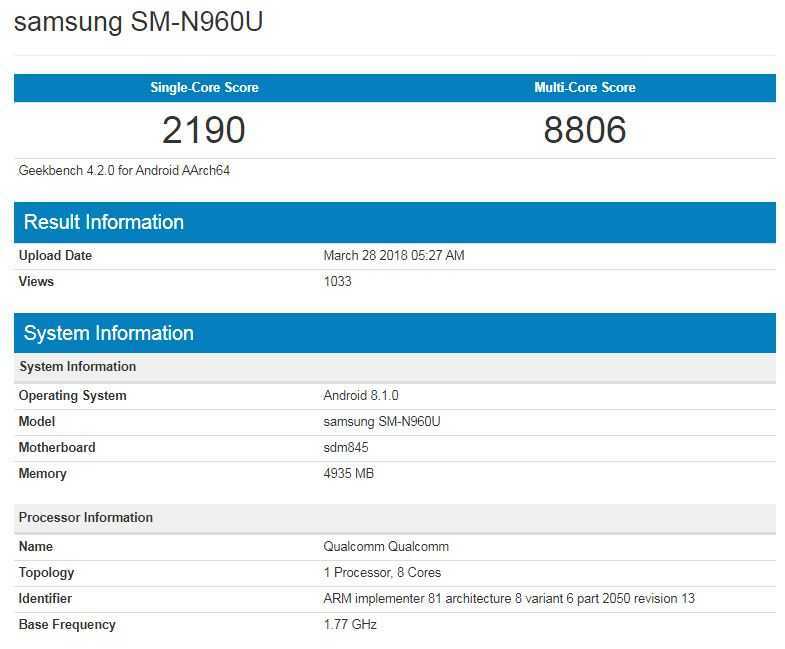 A recent Geekbench listing has confirmed a few valuable details of the Galaxy Note 9 with model number SM-N960U. Listed below are the details the were found in the listing. Clock speed of 1.77 GHz. Considering the high multi-core points it has achieved (8806 points), it can be said that it will be one of the most powerful smartphones when it makes it to the market. The model SM-N960U is expected to be the US model and for other regions we can expect Exynos 9810 Soc like the Galaxy S9 and S9+. A new leaked Samsung Galaxy Note 9 render image has nearly confirmed the final design of the phone. 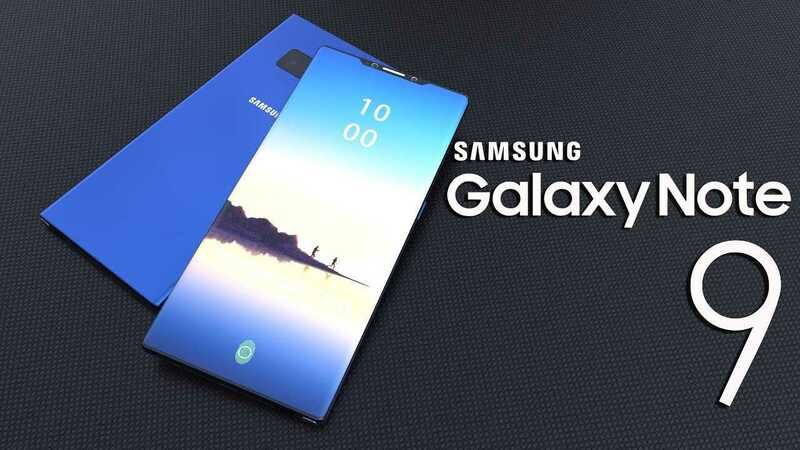 While Samsung is acquiring design ideas and suggestions for its new upcoming device Note 9, this rendered image that has leaked online could be revealing vital details about the design. According to the image, the overall design of Galaxy Note 9 looks a lot like the Samsung Galaxy S9 and Galaxy S9+ models. The design thankfully doesn’t use a top notch like the iPhone X but keeps the bezel size as small as possible to justify the display. The physical buttons are absent in the front but if we are to believe rumors, the in-display fingerprint scanner will be implemented at the bottom of the display. In-Display or Rear Fingerprint Sensor? Samsung Electronics is reviewing three to four solutions prepared by Samsung Display in a bid to choose the best one to implement the fingerprint scanner behind the display. The final decision on adopting the technology in the upcoming Galaxy Note 9 model is pending right now is expected to be confirmed before the end of this month. Based on a recent report by SamMobile, the upcoming flagship model is being designed with two build numbers namely the ‘N960FXXE0ARB7’ and ‘N960FXXU0ARC5’. The report further adds that Samsung has begun working on the software for the Galaxy Note 9 two weeks earlier when compared to the Galaxy Note 8. Once they finalize their decision to add the in-display fingerprint sensor, the phone could get launched earlier this year than the Note 8. The Samsung Galaxy Note series usually get launched in the month of August and even if the company decides to implement the technology, they have the time to finalize the decision and bring in a new technology in their upcoming model. In contrast to the rumors and the leaked render, another report claims that Samsung is in a tight situation and cannot risk implementing the in-display fingerprint sensor. Bringing in a new technology requires extensive testing and the company doesn’t have enough time to carry it out. If Samsung manages to bring it with the Galaxy Note 9, it would be a great addition to the smartphone industry and more brands will follow.